Calusa Park is a small, gated community in Nokomis just off the western periphery of North Venice. Homes for sale were first offered here in April 2014 after which its 88 home sites were built out in the following years. The development of Calusa Park was a project of national homebuilder D.R. Horton which capitalized on the strong rebound of the Sarasota real estate for sale after the Great Recession. 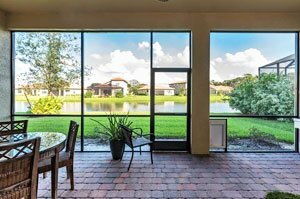 The market success of Calusa Park homes for sale is likewise largely due to their location ideal for commuters. These residences are located just off Laurel Road, a major corridor linking eastward to many points of interest in Venice including some employment centers. A short distance west, Laurel Road intersects with U.S. 41 conduit to other local attractions of south Sarasota County. A maintenance-included development, Calusa Park provides family-friendly features. It has, for instance, a resort-style lagoon pool with a spacious and well-furnished deck. There are no CDD fees in this community which likewise enjoy low HOA fees. Choice home sites at Calusa back up to the community’s centerpiece lake. Other home lots are buffered by lush and verdant landscaping. Calusa Park homes for sale come in either one- or two-story designs. The single-story homes in this community typical feature two to three bedrooms within floor areas of about 1,800 square feet and their asking prices quoted in the $300s. Larger, two-story Calusa Park homes for sale are priced in the $400s, with typical floor plans of up to 3,164 square feet designed with four bedroom, three baths, an office/den and a two- car garage. Because of their superb features, available residences in this community can sell within just a few weeks of their listing on the Sarasota real estate market. Convenient access to shopping and dining outlets further make these Venice homes for sale move fast on the market. A few minutes’ drive on Laurel Road on its western junction with U.S. 41 opens access to such retailers as Walgreens, CVS Pharmacy and Publix Supermarket. Three bank branches—Chase, Capital and SunTrust—are also in this area of Nokomis Village likewise host to a U.S. Postal Service office. Opposite east also on Laurel Road towards Pinebrook, there is another Publix near the top-rated Laurel Nokomis School. Besides Nokomis Beach a short drive west of Calusa Park, water-based recreational pursuits, such as boating and fishing, can likewise be as easily enjoyed in the nearby Venice Island and Casey Key. 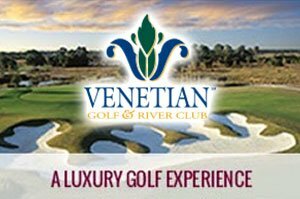 Eastward, the choice of outdoor activities can shift to golfing at the Venetian Golf & River Club. An option as enjoyable is the Venice Myakka Park just off east of this country club. This park features 10 waterfront acres with picnic areas, a kayak launch, playground and walking trails. Even closer, Calusa Park’s western periphery adjoins the Legacy Trail, a 10-mile-plus carless stretch linking Sarasota and Venice and providing an excellent track for bikers and runners. Owning a home in Calusa Park also puts you only about two miles from Interstate 75, gateway to more life and leisure destinations in the Southwest Florida region. 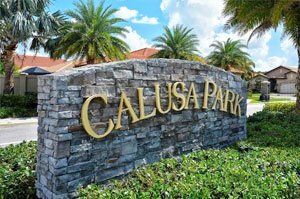 Below are the current real estate listings available at Calusa Park.